In blender or food processor, place orange liqueur, lime juice, powdered sugar and ice. Cover; blend until smooth. Spoon into nonmetal freezer container. Cover; freeze until almost firm, 2 to 2 1/2 hours. To serve, if mixture freezes completely, let stand at room temperature about 30 minutes. Rub rims of glasses with lime wedges; dip in salt to coat. Into blender or food processor, spoon orange liqueur mixture; blend until slushy. 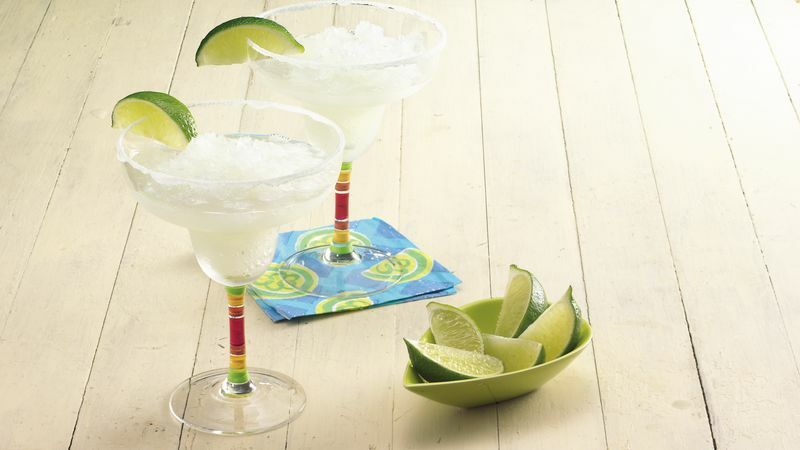 Place 1/2 cup slush in each salt-rimmed glass; add 1 to 2 tablespoons tequila. Garnish with lime wedges. There are several types of orange-flavored liqueurs available, including Triple Sec, Cointreau and curacao. All will work well in this recipe.